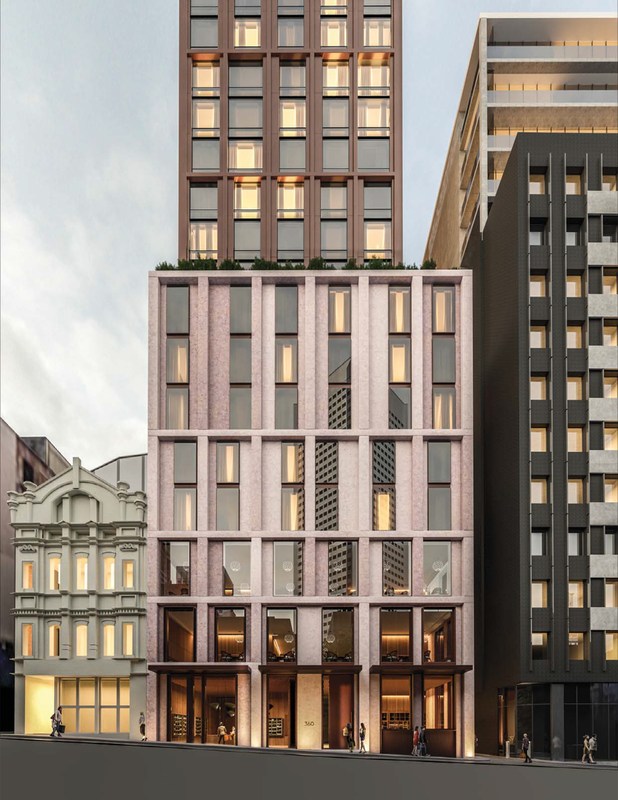 Tonight the City of Melbourne via its Future (Planning) Committee will consider the merits of a hotel proposal at 360 Little Bourke Street, with its planning officers recommending approval for the Bates Smart-designed scheme. Pending approval, the proposal for proponents Roxy-Pacific would see the construction of a 24-storey hotel rising to an overall height of 80m and comprising 308 hotel rooms, supported by a retail tenancy to ground floor and a basement restaurant tenancy. The $68 million proposal would replace a circa 1923 six-storey commercial building which, despite displaying some architectural and historical merit, is not located within a Heritage Overlay (existing or proposed). "The development has a floor area ratio of 17.6:1 and satisfies the modified requirements of DDO10 for podium height and tower setback above the street wall and from side and rear boundaries. The development is appropriately sited, massed and articulated to satisfy the design objectives and built form outcomes in DDO10." Bates Smart's design response draws on the rhythm of the surrounding streetscape with a predominantly vertical expression. This is achieved through the articulation of pilaster and slab elements, which provide the facade with depth and a framework which also allows for the staggering of solid and transparent elements to create a sense of movement along the street, providing passersby with a visually interesting podium. Additionally, the podium provides a transition or mediator between the 12-storey streetwall to the east and 4-storey streetwall to the west. "The vertical expression is achieved by suppressing the spandrel panels every second or third floor and utilising an engaged column element that attaches to the facade and continues up building in both the podium and tower. This provides articulation and allows for a play of light and shadow across the facade. The podium also plays on the concept of verticality by modulating the expression of the slab elements and using a single, then double, then triple storey step to draw the eye upwards from street level. The increasing steps create a much longer and more elegantly proportioned facade bay at the upper levels of the podium. Each facade bay is broken down into a solid vertical spandrel element and a fixed width window element that moves horizontally within the facade bay to create a sense of movement and further contribute to drawing the eye upwards. The tower continues the facade bay proportion established at the upper level of the podium and continues it throughout the tower by linking three levels between the engaged columns causing an elongation of the scale of the facade bay, adding to its vertical reading." The podium is characterised by its red pigmented precast concrete finish with glazed apertures, providing the development with a solid robust element which anchors it into the streetscape. By contrast the tower element is a combination of bronze powdercoated aluminium and glazing. As the development has an overall GFA of 17,758 sqm, City of Melbourne is the Responsible Authority for issuing a planning permit. This is less than the 25,000 sqm required for the development to be considered by Planning Minister Richard Wynne's department.